Thanks, here, to my buddy Darrin for an afternoon on his chilly home waters, for his photo of an old man chasing trout, and for the conversations that inspired this bit of verse. I have one or two S.J.'s. I have them under glass and labeled "use only in desperation". Nice piece Mike. "Tattered felt in liquid breeze" - very nice, very nice. You may have had to resort to the jaun, but turnover is a tough time no matter where you fish. I ain't proud, Austin. But sometimes you gotta do what you gotta do... just short of dynamite. Good hearing from you! Mike, from one ol' Fly Fisherman, to another, "Been There and Done That". 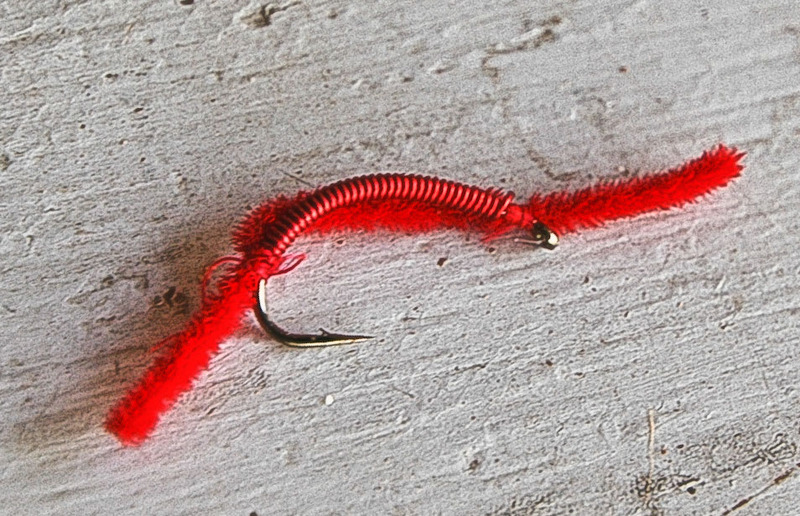 Inexplicably, most fly fishers I know have some San Juan Worms buried somewhere in there plan! Why do we flinch at using SJ worms that imitate an actual trout food, but brag about the rookie that we fooled with a royal coachman that imitated...ummmm....nothing? Nice work here Mike. Always a plan, Mel. Always. Now that is an excellent question, Jule. We fly fisherpersons are an odd lot, to be sure. I suspect the answer lies in the fact that SJs work so bloody well and we, for whatever reason, have chosen the hard way. Let's face it. If fishing efficacy was our goal, we wouldn't be wavin' fly rods. After all, Royal Coachman is so much more elegant than worm, don't you think? Nicely done Mike. I'm not too proud to say that I keep a carton of earthworms in the frig. Or I did until my wife tried to serve them to me for dinner. Now I stick with the SJ worms.